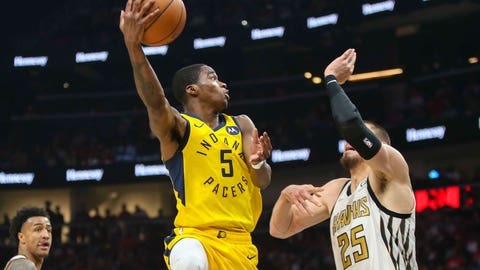 Edmond Sumner was the hero for the Pacers, hitting three free throws and finishing with 22 points. ATLANTA — The Indiana Pacers‘ final playoff warmup generated a rare triple dose of good news — rest for the starters, valuable experience for the backups and a win for all. Taurean Prince‘s 3-pointer with 1.1 seconds remaining gave Atlanta the lead, but DeAndre Bembry‘s foul on Sumner’s last-second 3-point attempt changed the game.